This article originally appeared on edutopia.org on 6/29/2015. Check it out here. When I was in high school, I respected the teachers who respected me back. I took interest in those teachers who took interest in me. When we reminisce on the “glory days” of high school, I’m sure we all can think of a teacher or two who was more interested in hearing their own voice than relating to teenagers. It’s funny, because we often forget that students (really at any age) are much keener than we presume – they know which of their teachers are interested in establishing relationships, and which aren’t. 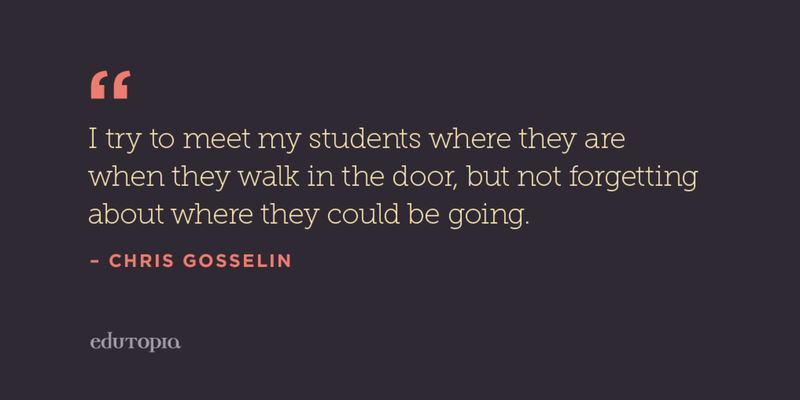 As teachers, we show up at work every day for one reason: our students. We are invested in them: their well-being, comfort, and learning rest and rely on the learning community that we establish in our classroom every day. It’s our responsibility to give those students a safe place where they feel valued, accepted, and cared for. Edutopia.org featured this quote on Twitter last week. I read it quickly at first when I saw it and thought to myself, “Hey, that sounds familiar…” I was blown away! At some point during any given school day, I’ll hear or read about an initiative that doesn’t necessarily make me uncomfortable, but perks up my ears. Don’t get me wrong: I firmly believe that new ideas or policy in education are important, and promote and foster change in the “business” of what we do. Common Core is a good thing. New policies and procedures in educator supervision and evaluation are good things. It is important for the culture of education to continue to evolve, shift, and change based on the world in which our students live. This is a fact. Things are changing, so teachers must too. High school, like many of us can remember, is a weird time for a lot of reasons. Spoiler alert: most teenagers are more worried about who they are going to sit next to at lunch than their English homework. Instead of condemning this mindset – only continuing to fulfill the role of being the mean adult looking over your shoulder – it’s important for trusted adults (in and out of school) to recognize that adolescence is a critical point in a young person’s life. Neurons are firing on overtime trying to make sense of the stresses of seeking a place to fit in. Of course, social pressures and mores take precedent. It’s natural. As teachers, we have to make a choice: We can either ignore this behavior, putting it off as just a “phase” and playing down the social-emotional needs of our students; or, we can recognize that this stress has a direct impact on student learning and develop and implement effective strategies that teach our students how to cope with this very normal time. The strategy I’ve chosen to focus on is creating and maintaining positive and meaningful relationships with my students, and when I leverage these relationships to promote a culture of understanding and respect in my classes, amazing things can happen. Check out this interview with Frank McCourt, author of Angela’s Ashes, on NPR’s “All Things Considered”. As you may know, a goal of mine this year is to analyze and address my students’ relationship with reading. Please fill out this survey to help! April calendars are now LIVE! I know, you’ve been refreshing the page all weekend. To download and listen to the literary terms podcast, click here. If you are having trouble downloading the file, you can always go to our Google Classroom site and listen to it there!